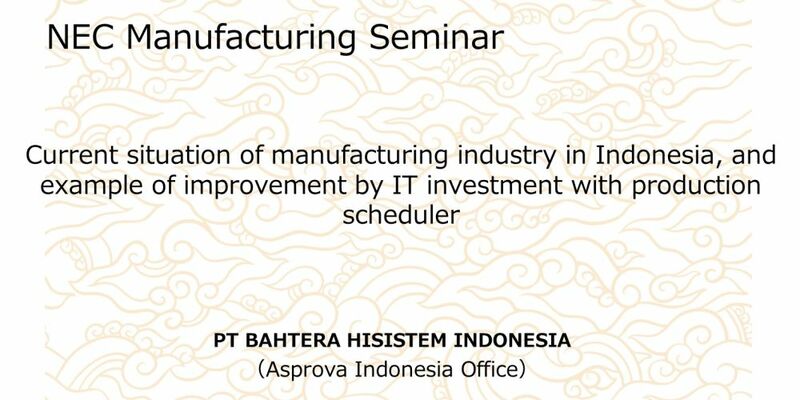 I will explain based on the case about the system implementation for making the demand forecast in consideration of the supply capacity of the in-house production resource. Here considering the subsystem of the production scheduler, there are three types of the interface developed for improving the usability, input interface that integrates the existing master and the additional master, result collection interface by the bar code scanner or handy terminal, and output interface for output such as production orders and availability forecast comparison tables. When proposing a production scheduler, it is more important how a customer can draw an operation story than a functional explanation, so the three interfaces are very effective in proposing an operation story at a manufacturing site in Indonesia. The original purpose of the production scheduler is to prepare a detailed production plan and issue work instructions at the field level. In plants where demand fluctuation is small and stable, daily work instructions are issued by site judgment. However the fluctuation in demand becomes hard to predict, work instruction by the production scheduler is going to be effective. I have been to Singapore for 2 days to get a new working VISA, VITAS(Visa Tinggal Terbatas=Index 312) just before KITAS expired date at the end of last month. Before that I have got VISA Telex approval (VTT) which is necessary to be issued VITAS according to the timing of EPO (Exit Permit Only) of former KITAS.